On 16/12/2014 Mossos d'Esquadra (Catalan “independent” police ‘squaddies’) stormed 14 homes and social centers in Barcelona and Madrid, destroying or stealing everything of value. 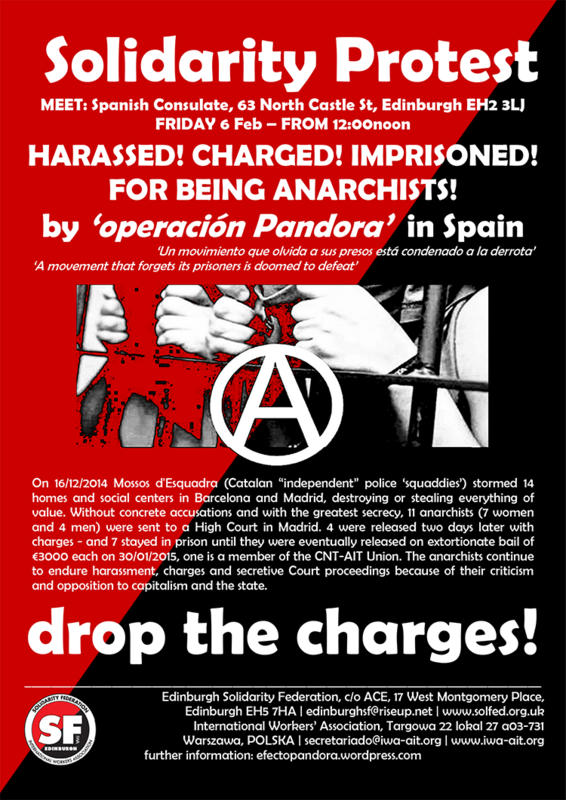 Without concrete accusations and with the greatest secrecy, 11 anarchists (7 women and 4 men) were sent to a High Court in Madrid. 4 were released two days later with charges - and 7 stayed in prison until they were eventually released on extortionate bail of €3000 each on 30/01/2015, one is a member of the CNT-AIT Union. The anarchists continue to endure harassment, charges and secretive Court proceedings because of their criticism and opposition to capitalism and the state.